Turn your vision of a dream studio space into a reality with Inside the Creative Studio. 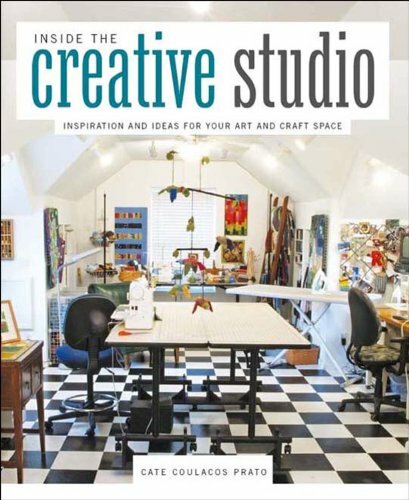 The professional artists and crafters of Studios magazine give you the tools to create your own one-of-a-kind artistic environment in this best-of compilation. Learn how to find space in your home, whittle down your stash, maximize your storage and organization possibilities, and manage your stash of supplies and equipment to keep your work space functional and fun to work in. Experts will also show you how to repurpose furniture, integrate recyclables, and showcase vintage items to establish a space with purpose and personality. You will spend less time struggling with your studio, or lack thereof, and more time actually creating in your unique space. Regardless of your time, money, or space, Inside the Creative Studio offers charming and innovative solutions for every lifestyle. Artists and crafters of all types, including quilters, fiber artists, mixed-media artists, jewelry makers, sewists, painters, writers, bloggers, and more, share their stories, tips, and studios. Beautiful photographs and friendly dialogue walk you through these active spaces as if you were getting your own private tour. From spacious oases to cute and compact retreats, each space offers countless inspirational ideas. With some of the best articles and creative inspiration from Studios Magazine, Inside the Creative Studio offers everything you need to know to spend less time fussing with your space and more time enjoying your creative work.